"Being the life of the party will be the death of me." That's a quote on a tea towel hanging in my kitchen. The invitation to the next party I'm planning. Those in attendance will all be winners. Only two episodes left until the bittersweet end. Is it possible to love a television show more than some of your friends? 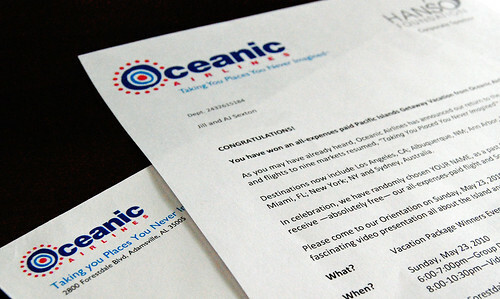 I'm a little concerned about Oceanic Airlines. Plane crash fears aside, it appears they've sent a congrats letter to Jill and Al Sexton, but tickets to Jill and Jonathan. That seems like a pretty big oversight. Personally, I hope Jill, Al, and Jonathan all make it to the party. 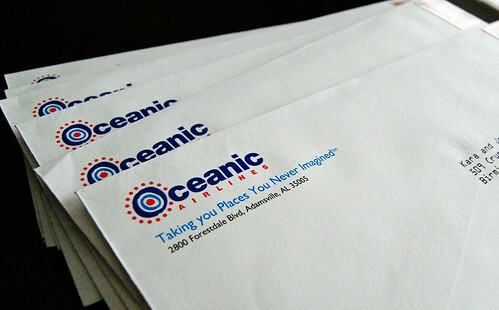 I'm sure Oceanic wanted the letter to be more informal so they listed Jonathan as "AJ," his preferred name. These invitations are awesome! I wish I was a LOST fan! L: Thanks dear - I wish you were too! C: You are figgin' nice to notice. Ladies: Figgin is the same as friggin. Friggin is the same as the F-bomb. Do you kiss you moms with those figgin' mouths. J: Caryann will have to speak for herself. As for me and my house, I serve the Lord. That's why I prefer big ol' big as my go to. Those are absolutely awesome. How'd you do those? M: Snagged some logos off the web and then trudged through Photoshop Elements to tweak. I can email more details if you're interested! Jamie, I stand (sit) amazed. You are so planning my Sweet 26.
jc: Done. Sweet 26 parties are my fave. These are absolutely amazing! 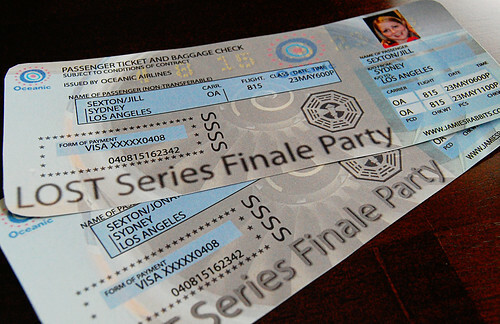 I only wish I had started watching Lost before now!